Wayne's World is a 1992 American comedy film directed by Penelope Spheeris, produced by Lorne Michaels, and written by Mike Myers, and Bonnie and Terry Turner. It stars Myers in his feature film debut as Wayne Campbell and Dana Carvey as Garth Algar, a pair of rock fans who broadcast a public-access television show. It also features Rob Lowe, Tia Carrere, Lara Flynn Boyle, Brian Doyle-Murray, Chris Farley, Ed O'Neill, Ione Skye, Meat Loaf, and Alice Cooper. Wayne's World was released in the US on February 14, 1992. A critical and commercial success, it was the eighth-highest-grossing film of 1992 and it remains the highest-grossing film based on Saturday Night Live skits. A sequel, Wayne's World 2, was released on December 10, 1993. In Aurora, Illinois, rock fans Wayne Campbell and Garth Algar host a public-access television show, Wayne's World, from Wayne's parents' basement. After they sell the rights to the show to television producer Benjamin Oliver for $10,000, they celebrate at a night club, where they avoid Wayne's troubled ex-girlfriend Stacy. Wayne falls for Cassandra Wong, vocalist and bassist of the band performing that night, Crucial Taunt, and impresses her with his Cantonese. He purchases a 1964 Fender Stratocaster electric guitar he has long coveted. Benjamin attempts to steal Cassandra from Wayne by using his wealth and good looks. He distracts Wayne and Garth with all-access tickets to an Alice Cooper concert in Milwaukee, while offering to produce a music video for Crucial Taunt. At the concert, Wayne and Garth make the acquaintance of a bodyguard to music producer Frankie Sharp, head of Sharp Records. While filming the revamped Wayne's World under Benjamin's oversight, Wayne and Garth find it difficult to adjust to the professional studio environment. Their contract obliges them to give a promotional interview to their sponsor, Noah Vanderhoff, who owns a franchise of amusement arcades. After Wayne publicly ridicules Vanderhoff, he is fired from the show, causing a rift in his friendship with Garth. Jealous of the attention Benjamin is giving Cassandra, Wayne attempts to prevent her from participating in the Crucial Taunt music video shoot. She breaks up with him, furious at his lack of trust. Wayne and Garth reunite and hatch a plan to win Cassandra back by having Sharp hear Crucial Taunt play. While Garth and their friends infiltrate a satellite station with the aid of Benjamin's assistant, Wayne goes to Cassandra's video shoot, but embarrasses himself in an attempt to expose Benjamin's ulterior motive. As he leaves, Cassandra changes her mind about Benjamin. Wayne apologizes and they return to Aurora. The Wayne's World crew hacks into Sharp's satellite television and broadcast the Crucial Taunt performance from Wayne's basement, where Sharp and Benjamin converge. Sharp declines to offer Crucial Taunt a record contract, Cassandra breaks up with Wayne and departs with Benjamin for a tropical resort, Stacy reveals that she is pregnant with Wayne's child, and a fire destroys Wayne's house. Dissatisfied, Wayne and Garth turn to the film's audience and halt proceedings. They restart the scene and unmask Benjamin as "Old Man Withers" in a Scooby-Doo parody ending. Still unsatisfied, they start again with a "mega happy ending" in which Cassandra signs a record contract and reunites with Wayne, Garth begins a relationship with a waitress, and Benjamin learns that money and good looks do not necessarily bring happiness. Alice Cooper with Pete Friesen, Derek Sherinian, Stef Burns, and Jimmy DeGrasso as themselves. Wayne's World was greenlit by Paramount Pictures in 1991. It was the second film based on a Saturday Night Live sketch following The Blues Brothers in 1980. Producer Lorne Michaels hired Penelope Spheeris to direct, who had directed several music documentaries. Spheeris said, "I had been just struggling as a female director in this business for many years. I was 45 years old when I got that job. I just kept hanging in there. And Wayne's World happened, and it sort of flipped my life around." Spheeris clashed with Myers during filming. She told Entertainment Weekly that Myers was "emotionally needy and got more difficult as the shoot went along. You should have heard him bitching when I was trying to do that 'Bohemian Rhapsody' scene: 'I can't move my neck like that! Why do we have to do this so many times? No one is going to laugh at that!'" She said she attempted to assuage Myers by having her daughter provide him snacks, and on one occasion he stormed off the set, upset that there was no margarine for his bagel. Myers and Spheeris argued over the final cut of the film, causing Myers to prevent Spheeris from directing Wayne's World 2. The movie was a box office success, debuting at number one. The film's final domestic gross was $121,697,323, making it the eighth-highest-grossing film of 1992 and the highest-grossing of the 11 films based on Saturday Night Live skits. On Rotten Tomatoes, the film has an 84% "Certified Fresh" rating based on 50 reviews, with an average rating of 6.77/10, with the critical consensus stating, "An oddball comedy that revels in its silliness and memorable catch phrases, Wayne's World is also fondly regarded because of its endearing characters." On Metacritic, the film has a score of 53 out of 100, based on 13 critics, indicating "mixed or average reviews". Roger Ebert said in his review: "I walked into Wayne's World expecting a lot of dumb, vulgar comedy, and I got plenty, but I also found what I didn't expect: a genuinely amusing, sometimes even intelligent, undercurrent." However, Desson Howe wrote in the Washington Post that making a movie out of such a "teeny sketch" is "better than you'd expect" but criticized the finale as "an attempt to lampoon movie endings" "and a despair-driven inability to end the movie". Filled with pop culture references, the sketches and the film started catchphrases such as "Schwing!" and "Schyea", as well as popularizing "That's what she said", "Party on!" and the use of "... Not!" after apparently affirmative sentences in order to state the contrary. The soundtrack album reached number one on the Billboard 200. The album was certified double-Platinum by the RIAA on July 16, 1997. The use of Queen's "Bohemian Rhapsody" in the film propelled the song to number two on the Billboard singles charts 17 years after its first release. The studio originally wanted to use a Guns N' Roses song for the scene, but Myers demanded "Bohemian Rhapsody", even threatening to quit the production unless it was used. Freddie Mercury, the lead singer of Queen, had died of bronchial pneumonia resulting from AIDS a few months before the film's release. However, Mercury saw the head banging scene before his death, finding it hilarious and approved the song for the film's use. Gary Wright re-recorded "Dream Weaver" for the film, which is heard whenever Wayne looks at Cassandra. Tia Carrere sang her own vocals on the songs she performed in the film, as well as cover songs such as Sweet's "The Ballroom Blitz", which were included on the film's soundtrack album. Myers originally wanted Alice Cooper's "I'm Eighteen" and "School's Out" in the film, but Cooper's manager Shep Gordon convinced him to use "Feed My Frankenstein" instead. It was Myers' first meeting with Gordon and it made such a strong, positive impression on him that they formed a friendship. Myers directed a 2014 documentary about Gordon, titled Supermensch: The Legend of Shep Gordon. ^ "Wayne's World (1992) – Daily Box Office". Box Office Mojo. Retrieved 2016-02-02. ^ "Mike Myers couldn't drive during 'Wayne's World'". New York Post. 2017-02-02. Retrieved 2017-05-17. ^ Pirnia, Garin (2017-02-06). "How Wayne's World Made—and Broke—Its Director's Career". Vanity Fair. Retrieved 2017-05-17. ^ a b "Mike Myers: Man of Mystery". Entertainment Weekly. 2008-06-16. Retrieved 2017-05-17. ^ Brandon Kirby (April 24, 2013). 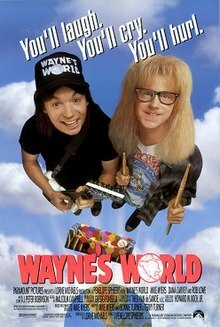 "Mike Myers, Dana Carvey Set Aside 'Wayne's World' Feud at Academy Screening". The Hollywood Reporter. Retrieved 2015-07-08. Carvey and Spheeris both notoriously fell out with Myers despite the 1992 film's huge success. Myers is said to have blocked Spheeris from directing the 1993 sequel because she'd ignored his edit suggestions on the original. ^ "How Mike Myers and Dana Carvey Resolved Their 'Wayne's World'-'Austin Powers' Feud". The Hollywood Reporter. April 11, 2013. Retrieved 2015-07-08. Myers blocked Spheeris from directing the 1993 sequel because she'd ignored his edit suggestions on the original (her cut already had tested well). And Carvey felt Myers later stole his Dr. Evil impression for Austin Powers, which supposedly was based on Carvey's goof on Lorne Michaels. ^ Fox, David J. (1992-03-03). "Weekend Box Office `Wayne's World' Keeps Partyin' On". Los Angeles Times. Retrieved 2010-11-18. ^ Fox, David J. (1992-03-17). "Weekend Box Office `Wayne's World' Gains in Fifth Week". The Los Angeles Times. Retrieved 2010-10-26. ^ "Alphabetical Movie Index A-Z". Box Office Mojo. Amazon.com. Retrieved 2011-01-17. ^ "1992 Yearly Box Office Results - Box Office Mojo". Boxofficemojo.com. Retrieved 20 August 2017. ^ "Wayne's World". Rottentomatoes.com. Retrieved 2017-08-20. ^ "Wayne's World Reviews". Metacritic. Retrieved 2016-07-17. ^ Ebert, Roger. "Wayne's World Movie Review & Film Summary (1992) | Roger Ebert". Rogerebert.com. Retrieved 2017-03-25. ^ Howe, Desson. "Wayne's World (PG-13)". Washingtonpost.com. Retrieved 2017-03-25. ^ "Schwing! Mike Myers & Dana Carvey's 'Wayne's World' Reunion Recap". FirstShowing.net. 2013-04-25. Retrieved 2016-07-17. ^ "This is the American Film Institute's list of 500 movies nominated for the top 100 Funniest American Movies" (PDF). Afi.com. Retrieved 2017-08-20. ^ a b "ACE VENTURA : All-righty then!" (PDF). Afi.com. Retrieved 2017-08-20. ^ "AFI's 100 Years... 100 Songs" (PDF). Afi.com. Retrieved 2017-08-20. ^ "Search results for Wayne's World". riaa.com. Retrieved 8 August 2016. ^ a b "WTF Podcast with Mark Maron". WTF. 2014-07-28. Retrieved 2014-07-31. ^ "Brian May: 'Wayne's World' "Bohemian Rhapsody" Scene Hit Close to Home". Guitar World. 2016-07-18. Retrieved 2017-06-04. ^ "The Five Most Culturally Significant Wayne's World Songs". LA Weekly. Retrieved March 17, 2019. ^ Martin Charles Strong; Brendon Griffin (2008). Lights, camera, sound tracks. Canongate. p. 396. ISBN 978-1-84767-003-8. Retrieved March 17, 2019. Wikimedia Commons has media related to Wayne's World.